The capital city of Connecticut and currently the fourth-largest in the state, Hartford is also known by other interesting monikers like the “Insurance Capital of the World.” But it’s not only the insurance industry that makes the city thrive. It’s also well-known for its medical, research, and educational centers, as well as architectural landmarks like the Connecticut Science Center, Governor’s Mansion, and Cathedral of St. Joseph. Hartford encompasses a community of more than 120,000 Connecticuters who consider declare it their home, sweet home. To Superior Remodelers, the beauty and functionality of these homes matter. Home renovation and construction are our forte. We’ve been in business for almost a decade, during which time we have expanded our menu of services to include roofing, siding, spray foam insulation, replacement windows, gutters, and more. Such a breadth of services—paired with our commitment to quality and professionalism—is what makes us a popular remodeling choice in Hartford. Furnish your home with new roofing, windows, and other topnotch upgrades with Superior Remodelers. Superior Remodelers is a licensed commercial and residential home improvement contractor with headquarters in Newtown, Connecticut. We’ve earned an A+ rating from the Better Business Bureau (BBB), the highest industry standard, and have been screened and approved by Home Adviser. We're also approved by the Federal Emergency Management Agency (FEMA). Our company head, Peteris Torsters, found his footing in the construction industry upon moving to America in 1998. In 2011, he took a leap of faith and applied all that he’d learned about the craft into his own business. 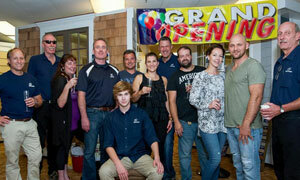 Ever since, Superior Remodelers has morphed into one of the largest client bases in the state of Connecticut. Our customers can cite several reasons why we deserve to have the word “superior” in our name: we’re creative, we’re efficient, and we have your home’s best interest in mind. After we’ve gotten to work on the residential or the commercial site, good results will be seen immediately. We’ll have secured your home or workplace against leaks, inclement weather, debris, and other incidental forms of damage to the property. Your building will look neat, aesthetically pleasing, and livable to all those who occupy it. For repairs, renovations, or installations to be done in your Hartford home or business, choose only Superior Remodelers. Contact us on our web page or call us at 888-330-8148. You can also visit our Connecticut showroom to view flooring, window, home siding, roofing, or other samples related to home improvement. We’ll be happy to engage you on anything related to home construction and remodeling! Also known as the “Insurance Capital of the World,” the city of Hartford is the capital of the state of Connecticut and is made home to 124,893 people and counting. Much of this city’s landmarks and establishments are some of the nation’s oldest like the Wadsworth Atheneum, the Bushnell Park, and the Hartford Courant. Adrien Block, a Dutch explorer, was one of the first Europeans to have explored this part of the United States. He, along with fur traders coming from New Amsterdam, returned in 1623 and had a mission to establish a trading post and fortify the area for the Dutch West India Company. The name of their fort was called Fort Hoop, and in 633, Jacob Van Curler bought the fort from the Pequot chief for a small fee. By 1654, however, the fort was abandoned and instead, was stationed by soldiers. Several years after its colonial era and numerous events later, the city of Hartford has transformed itself to a place filled with architectural marvels and establishments. Some point of interests includes the Cathedral of St. Joseph, Cheney Building, Connecticut Science Center, and the Connecticut Governor’s Mansion.